Obi-Wan: "I have a bad feeling about this." Probably most sci-fi geeks do just what Dan and I do every time we watch this movie: debate what went wrong. Let's see. We have a boy with a great talent, leading a dull and pointless existence on a backwater planet. A great mentor and wise man comes along and sets him on his path before sacrificing his own life. The major focus is saving the life of a beautiful princess. I know what George Lucas had in mind. He was deliberately echoing his first Star Wars movie, now known as Episode Four. Where I think he really went wrong was the casting. Little Jake Lloyd most certainly did his best with the material, but the character was just too young to carry the weight of the story. Anakin should have been at least fourteen. (The age difference between Anakin and Amidala was too great and made me cringe, thinking about their future relationship.) And the story itself was just too juvenile. Did Lucas not realize that his fans had grown up? The other major, and I do mean major, mistakes were (1) Jar Jar Binks, (2) the Gungan/droid battle, (3) the incomprehensible political situation, and (4) the endless, oddly boring pod race that we knew Anakin would win. What was the point? I don't think anything could have fixed Jar Jar. My instant dislike for him made the Gungans uninteresting as characters, too, which made the huge Gungan/droid battle scene pointless, especially since it was all CGI characters and I had no emotional investment in any of them. It was like watching chess pieces blowing up. Pointless. But the pod race could have been exciting if it had been truly deadly. What if the life of Anakin's mother had been at stake? What if winning would have meant her death? What if Anakin had had an alien friend also in the race, and he had crashed and died? So what did I like about The Phantom Menace? Let me think. It's visually stunning. This movie was the first in which George Lucas could fully express his imagination on screen without the limitations of puppets and models. The alien landscapes are just amazing, all of them. 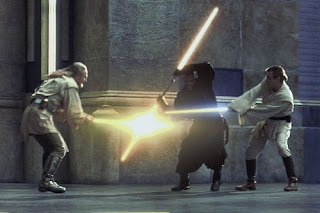 And then there are my glorious Jedi knights -- Ewan McGregor and Liam Neeson, who were both terrific. They gave us one of the best sword fights I've ever seen on film, too. The casting gods smiled on George Lucas when he cast Ewan McGregor as the younger version of the character played so memorably by Sir Alec Guinness. I shudder to think of what the prequel trilogy would have been like without him. And I have always liked Natalie Portman, and I think she did her best as Padme/Amidala. If her performance is mildly wooden, I can readily blame it on the stilted dialogue. Why, oh why didn't Lucas hire a script doctor? Imagine what this movie would have been like if, say, Joss Whedon had pumped up the dialogue. -- Along with debating What Went Wrong, it can also be fun playing "Who's behind the make-up" game. Is the Queen Natalie Portman or is it Keira Knightley? -- Mitichlorians. Virgin birth. No and no. And how could they say Anakin is too old to be trained as a Jedi? When do they usually start? When they're two? -- How could a fourteen-year-old girl be "elected" queen? Idiotic. -- The Sith Lord Darth Maul might have been scarier without horns. And why didn't they do an establishing scene, with him making mincemeat of some other poor Jedi knight? -- The most famous quote from this movie is Yoda's. It is constantly parodied. "Fear leads to anger. Anger leads to hate. Hate leads to suffering." -- Speaking of Yoda, he looks terrible and un-Yoda-like in this movie. Fortunately, he got an upgrade in Episode Two. -- If you're considering a rewatch of the Star Wars movies, you might want to check out J.D. Balthazar's article, How to Watch Star Wars.